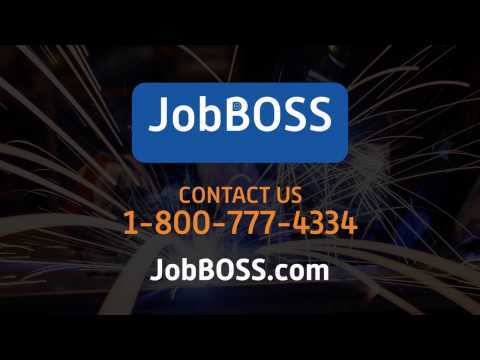 JobBOSS is an ERP (enterprise resource planning) platform built for small and medium-sized manufacturers in North America including contract manufacturers, job shops, make-to-order and mixed-mode manufacturers. The solution helps office and production staff to manage day-to-day job information and tasks for improved customer service and on-time deliveries. Organizations can automate and streamline quoting, order processing, inventory, advanced scheduling, quality management (ISO and ASI) payroll, accounting, and data collection processes. Users can create estimates and prepare quotes by selecting the appropriate costs, allowing the system to automatically make the necessary calculations. JobBOSS helps keep all rates up-to-date for fixed and variable costs, markups, outsourcing, and materials in one location. Job processing features enable production staff to create job orders based on customer orders and stock requirements. Users can view and order materials on the dedicated work order screen, and monitor the delivery of final products. The solution’s ShopBOSS schedule graph provides insights into available shop floor capacity and allows for flexible scheduling for material availability, actual job performance, and current work center load. The automated whiteboard lets users schedule or reschedule jobs using drag & drop to move operations to different days or work centers. The production dashboard in JobBOSS provides organizations with an accurate overview of the business, allowing users to track machine capacity, orders in progress, and to-do lists, as well as outstanding work orders and purchase orders. Users can also generate shipping documents such as pack lists, shipping labels, and bill of lading, with reporting to help keep track of on-time delivery rates. I came on board with my employer in October 2014. They had been using JobBoss for over 10 years. With my ERP background, I quickly discovered that my employer wasn't taking advantage of many of the available utilities, including the Scheduling module. Within 3 months I had all 30 of our machining centers, plus all of the secondary resources and operations, set up and testing completed. Routings were stripped back and rebuilt with proper resource requirement setups to ensure proper scheduling of work and proper timing and load representation. Shift and holiday calendars were constructed properly. We turned on Scheduling in February 2015. With the first pass of the global scheduler (running infinite loading and allowing schedules in the past) we came out with a past-due backlog of some 4000 hours. After updating job progress on about 150 jobs, realigning a few things and making some setup tweaks, we realized that we were still over 2000 hours past due. However, we now had the theoretical start and end dates to work with, we could time materials properly, and could graph our loads to see what we were doing to ourselves with our booking practices. Since then, we have improved our utility of the system across the board. Raw material and finished goods inventories are accurate, so we can now use the Material Planning functionality. Raw material issues due to planning are non-existent. PO's for outside processing are now accurately priced, timed, and generated straight from the job routing. Use of Picks, Transfers, and Extra Quantities have given our inventory transactions full transparency. I look forward to Unite 2017 when I can see hands-on what other companies are doing to tap this system's potential!Simple navigation, use of Favourites shortcuts, level of complexity is perfect for smaller organizations. Simple navigation, use of Favourites shortcuts, level of complexity is perfect for smaller organizations. Would like to be able to access more information directly from the Job (ie from an outside process, be able to access the Purchase Order that is linked to it). Our company has now used JobBOSS for around 4 years. We have found that the user interface is quite intuitive and straightforward to use. This is a plus when training new people on the system. Functionally, it has met most of the needs that we purchased it for. We loved the idea behind the scheduling module, but have found it to not be a good fit with our shop. We are primarily a custom high mix, low volume shop. This leads to many jobs that have potential to run in more than one pathway on the floor and most jobs are first run where we do not have a history of expected production run times to fall back on. We also have split our shop floor into three self directed production cells that have a fair amount of cross work. The self direction means many production decisions are made at the cell level and not at a command level. Because of these factors, we found that matching our shop floor to the scheduling module was exceptionally difficult unless we were willing to dedicate a full time person to keeping it accurate. In the end, we believe that the scheduling module would work better in a higher volume production environment with more of a top down command structure than how we operate. The reports that come with JobBOSS are reasonable, however, we have found that digging deeper into the data (at least the directions we looked) required special reporting. It is handy to have someone on staff who is comfortable working with SQL tables, data mining and creating custom reports. Exact does offer custom report creating. Just remember, it come at additional cost. As someone who does look behind the scenes and works to dig data out of the system, I am impressed with the amount of information that JobBOSS does capture. Additionally, it is quite well organized in its structure. On the front end, the user interface is intuitive and lends itself to easy training. As someone who does look behind the scenes and works to dig data out of the system, I am impressed with the amount of information that JobBOSS does capture. Additionally, it is quite well organized in its structure. On the front end, the user interface is intuitive and lends itself to easy training. Reporting. The stock reports are reasonable for a company that does not need to dig into its data very deeply. But the analysis at deeper levels would either require purchasing many custom reports or have someone on staff that can dig into the data and create custom reports. The scheduling module works best in an environment with minimal chance of perturbation. Systems that have a high degree of variation become hard to model accurately. I have used JobBoss for the last 6 years and it's great for a shop like ours with custom products. It handles everything from the initial customer quote to turning it into a sales order, defining specific jobs and component jobs all the way through shipping and invoicing. The various processes you might need are logically organized into modules which make performing specific tasks easy. The downside is the occasional lack of communication between the modules requiring you to complete some information multiple times. The only reason I did not give 5 stars across the board is the inability to look at the big picture (all open orders), drill down to the semi-big picture (a specific sales order), and so on down to the minutest detail. If you are looking at any of these areas by itself JobBoss is a great tool that does a terrific job at helping you manage a project; it could use a little tweaking to help you really manage multiple projects with ease.The level of detail available about any project, material requirements for the project, routing steps, and tracking of progress. A complete system available to manage every aspect of the shop from scheduling of employees and jobs, payroll, materials, and more. XML support to allow you to use external programs to exchange data with JobBoss. The level of detail available about any project, material requirements for the project, routing steps, and tracking of progress. A complete system available to manage every aspect of the shop from scheduling of employees and jobs, payroll, materials, and more. XML support to allow you to use external programs to exchange data with JobBoss. Inability to really drill down from a broad overview of projects in the shop down to specific details of a single job. Customer support for using XML extremely limited. Poor documentation on using it. Does not allow you to require completion of a routing step before beginning the next. Ability to track progress is 100% dependent upon employees logging into a job and recording their progress without any enforcement policy within the program. We have used JobBOSS in our Mixmode Jobshop for 5 years. The biggest advantage that we see in JobBOSS is that it is well-suited to the small manufacturer and job shop. The modules are functional for our day-to-day operations, which allowed us to standardize and increase our workload and throughput by at least 20%. The interface is user-friendly. We were able to implement the software very quickly compared to the software we were using. The workstations in the shop have given us a good handle on time collection. We also use the QuickBooks integration and it works flawlessly. Exact employees are very friendly and knowledgeable about their product. We get answers to our questions very quickly, and they are very helpful in solving problems we incur. The online portal is a huge asset for training new users and enhancements to the software’s customization. As good as the program is, there is room for improvement. We think it is just a few enhancements away from greatness. The software has several glitches that have not been fixed in the five years we have been using it. For example, you lose the information you are entering into a job or purchase order if another user is updating a related job or material. Sometimes, the software locks up and has to be forced to close and restart. This usually happens when you are trying to delete a raw material in a Job and select a different material; it's some kind of access violation. The updates of information changes between modules is slow and can be frustrating. For example, if a raw material is received from a PO and you want to add that material to a job and pick it from the inventory, you have to close the jobs module and reopen it to get the new inventory update; this should occur instantly. A few other enhancements would be nice (e.g. : autofill on names fields, uses of Return key to tab between fields, and a simpler method of customizing basic forms like can be done in QuickBooks). We purchased the ShopBoss scheduling module with high hopes of solving our delinquent deliveries. After about two years of trying to implement this module, we abandoned it for our old manual method. The JobShop module needs a simpler and more flexible scheduling module. it requires way too much time in operator maintenance to keep it functional. In a job shop environment the schedule has to stay on the balls of its feet because the priorities are always changing. We can do the job faster than we can change the schedule in JobBoss. JobBOSS is an integrated database that connects all our departments and data in one place and keeps our company and employees accountable to a system that provides us with solid and accurate information for daily operation and planning for the future. Although intuitive, JobBOSS is not out-of-the-box, first-day user-ready--so plan ahead and take advantage of the excellent training resources available. JobBOSS Customer Support is top notch. We were already working—but now with a little implementation, JobBOSS is working for us. JobBOSS works—and helps us work smarter!I like the way all of the JobBOSS modules are interconnected, sharing data, and referencing all of the modules together. JobBOSS is a well-designed database that allows our company to manage all of our operations in one resource. From scheduling to inventory, to payroll, to bookkeeping, JobBOSS works for us. The Customer Portal is a huge asset, providing video training, online support, support documents, and an experienced and professional staff of Customer Support representatives that have always responded to any software support request within 24 hours--and normally within just a few hours. I like the way all of the JobBOSS modules are interconnected, sharing data, and referencing all of the modules together. JobBOSS is a well-designed database that allows our company to manage all of our operations in one resource. From scheduling to inventory, to payroll, to bookkeeping, JobBOSS works for us. The Customer Portal is a huge asset, providing video training, online support, support documents, and an experienced and professional staff of Customer Support representatives that have always responded to any software support request within 24 hours--and normally within just a few hours. This product has so many elements, that it requires a strong software support person on location. JobBOSS requires much thought and preparation prior to implementation, but a company who does their research and commits to a dedicated effort before launching JobBOSS will quickly reap the rewards for the front-end effort. 1-year contract: $95 per month per seat. 3-year contract: $70 per month per seat. Add-on modules are available at additional cost. JobBOSS subscription price does not include private hosting charges. JobBOSS helps automate workflows, track costs, and create alignment within areas of operation that many shops find difficult to view all together. Quoting features provide users with immediate access to true labor and material costs for increased accuracy and confidence in quotes. Access real-time customer order information at any time during the order process and track jobs as they flow from one stage to the next. Keep track of all delivery schedules and review shipment history, and analyze performance to improve on-time deliveries. Project part cost and profitability on orders using tools for cost analysis to ensure the business stays healthy. Below are some frequently asked questions for JobBOSS. Q. What type of pricing plans does JobBOSS offer? Q. Who are the typical users of JobBOSS? Q. What languages does JobBOSS support? Q. Does JobBOSS support mobile devices? Q. Does JobBOSS offer an API? No, JobBOSS does not have an API available. Q. What other apps does JobBOSS integrate with? Q. What level of support does JobBOSS offer?